Dale Denby, Collectibles and Ecommerce Director at the Pasadena ARC, examines a donated antique clock. Vintage Tennessee license plates, silver flatware, sewing machine parts and an acoustic guitar—all part of the top 10 selling items by The Salvation Army last year on eBay. The ecommerce effort started in 2014 in the Western Territory, selling over 9,800 items in 2016 for gross sales of $636,000. As a source of additional income for seven adult rehabilitation centers (ARCs) and 11 corps-run thrift stores in the Northwest and Del Oro divisions, the online thrift sales are generating more funds for ministry. After a discounted nonprofit fee to eBay and PayPal, sales income is received at Territorial Headquarters and then attributed to the store of origin so that the profit funds local programs. The 2016 top seller, a Franklin Library 100 Greatest Books of All Time set, was listed for $699.99 and sold for $2,175 by the Pasadena Adult Rehabilitation Center (ARC). Rather than sitting on a thrift store shelf, the online market dictated the items higher value. 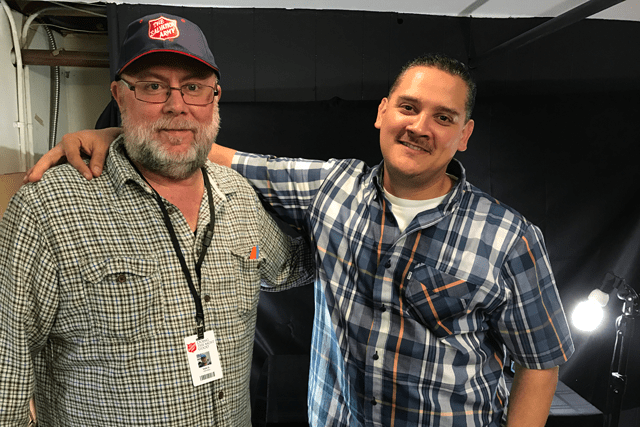 Dale Denby (l) and Daniel Sandoval work together to sell items on behalf of the Pasadena ARC on eBay. That penchant for the unique led online buyers to win bids for everything from LP albums to a transistor radio or a suitcase full of doll heads (bought for $30) from The Salvation Army. Ecommerce specialists use an internal system that allows The Salvation Army to run one online eBay storefront for its current 18 locations. Overseen by Wesley Tran, Territorial Ecommerce Manager, employees scour store shelves, shoot and post product photos and descriptions to eBay, ship sales and respond to customer emails. In 2017, Tran plans to gross $1 million in sales and hopes to include each of the West’s 23 ARCs. To join, a center simply needs a desk, packing supplies and an employee, willing to treasure hunt. In the Pasadena ARC warehouse—a labyrinth of receiving and sorting stations—beneficiaries bring bags and boxes of donations off of trucks and begin the sifting. Anything of potential value moves to the collectibles department, a cordoned off area in the center of the maze overseen by Dale Denby, Collectibles and Ecommerce Director. Daniel Sandoval, Ecommerce Specialist at the Pasadena ARC, points out items that are ready to ship once a bid finalizes on eBay. And it’s working. In its first 10 months of ecommerce operation, from March to December 2016, the Pasadena ARC grossed over $186,000 in online sales—money that will help to support a cost-free, biblically based six-month residential program to overcome addiction for 104 men and 12 women. It is one of 141 centers across the United States, which offer a chance at rehabilitation to more than 200,000 people a year. Last year, the 1,237 thrift stores nationwide recorded nearly $611 million in sales to the public, according to the Army’s 2016 annual report. That additional funding for increased mission starts on the warehouse floor. “I like to walk around every hour and ask if anyone has seen anything cool,” Denby said. From there, Denby sends items on to Sandoval, who researches, photographs and posts up to 15 items per day. Shop The Salvation Army online at go.usawest.org/eBay.